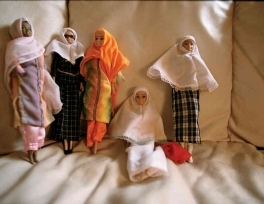 “I used to play with dolls in the presence of the Prophet (pbuh) and my girlfriends would play with me." Image-making (tasweer) is a controversial issue among Muslims due to the prophetic traditions that strongly prohibit pictures associated with idolatry and rivaling Allah’s creation. However, the Prophet made a concession regarding images and modern scholars have allowed images if they serve a useful purpose. All Muslims scholars allow pictures and images of things that do not have a soul, such as trees, rocks, landscapes, and so on. This concession was given by Ibn Abbas (may Allah be pleased with him) when he was asked for a judgment regarding images. I will tell you what I heard from the Messenger of Allah, peace and blessings be upon him. He said: Every picture maker will be in Hellfire, for every image will have its soul breathed into it and will punish him with Hell. According to some opinions, it is completely forbidden to make images of things with a soul. This is the strictest opinion and is the safest for Muslims who want to avoid unlawful pictures. However, there is strong evidence to suggest that it is not the images in themselves that are unlawful, but rather it was the intention for which they were used. The Prophet, peace and blessings be upon him, informed us about the reason Allah would punish the image-makers. Allah the Exalted said: Who is more unjust then he who considers his creation as My creation? Let him create an ant, or a grain of wheat or barely. So the reason image-makers are punished is because they intended to rival Allah’s creation or to use images for idol-worship. Furthermore, it is confirmed in the Quran that the law of previous prophets did not completely forbid images. Scholars say that this permission was abrogated by the advent of Islam. However, the verse is still evidence that images are not in themselves an unlawful major sin, because previous prophets cannot commit major sins. In fact, the Prophet, peace and blessings be upon him, made an exception to the prohibition of image-making in some specific cases. In this narration, the Prophet , peace and blessings be upon him, made a clear exception that images stitched on fabric are lawful if they are not being glorified, although some of the companions felt more comfortable if they did not take this concession. This permission was also extended to images of things with a soul as long as the items are not glorified. The Prophet, peace and blessings be upon him, allowed children to play with dolls that were images of living beings. 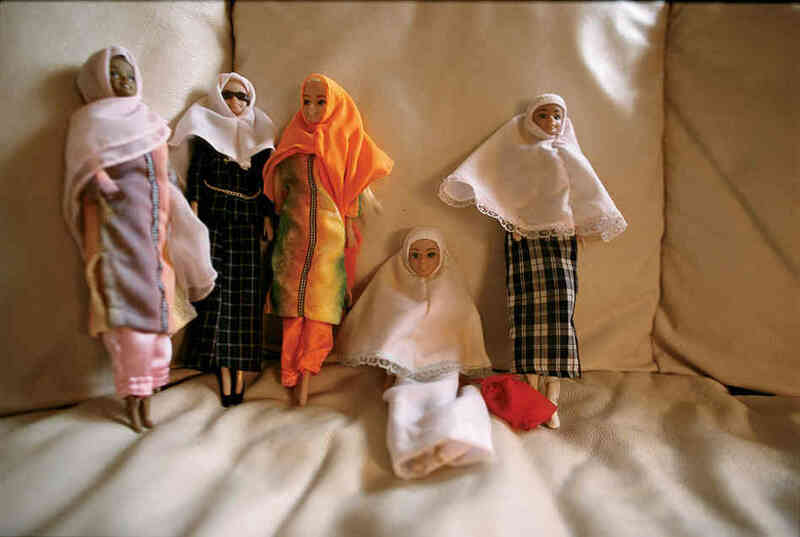 Aisha (may Allah be pleased with her) continued to keep these dolls, some of which were in the image of a horse, even after she became an adult. This narration is an authentic and clear tacit approval from the Prophet, peace and blessings be upon him, on the permissibility of having images of living beings as children’s toys. In another narration, Aisha (may Allah be pleased with her) had a curtain with images of birds on it. The Prophet, peace and blessings be upon him, at first prayed toward the curtain, but later he had the images removed because it distracted him during prayer. The Prophet, peace and blessings be upon him, did not command her to tear it up and instead she made it into pillows that he would sit upon. This narration shows that the Prophet, peace and blessings be upon him, at first prayed toward a curtain that had the image of a bird on it, but he later had it taken down so as not to distract himself during prayer. Had the image been inherently unlawful, he would not have prayed toward it in the first place. He also did not command the image to be torn and he allowed Aisha (may Allah be pleased with her) to make pillows from it. In addition, Gabriel (peace be upon him) once came to the Prophet, peace and blessings be upon him, with an image of Aisha (may Allah be pleased with her) on a cloth in order to show him a picture of his future wife. This narration demonstrates that it is permissible to use an image for the purpose of selection in marriage, as it is lawful for a man to look at the face of a woman he is considering to marry. Based upon all this and similar evidence, modern scholars have permitted images, pictures, photography, and cartoons if they are used for a good purpose. Most of the scholars, however, are against making and acquiring pictures for both humans and animals, with the exception being made for children’s toys and those which are not glorified such as those made in carpets, curtains and the like. This opinion is held by a number of the Prophet’s companions as well as many other scholars. Their reasons being that the Prophet, peace and blessings be upon him, confirmed Aisha (may Allah be pleased with her) to play with children’s dummies, when she was still young. He, peace and blessings be upon him, also used to pray while a partition was in front of him with a bird’s picture drawn on it, and all he, peace and blessings be upon him, asked was for it to be moved side ways as it was distracting him while in prayer, and he also used to rest on a cushion made by Aisha (may Allah be pleased with her) which had pictures on it. The strongest position which we advocate and which we see as closest to the intentions of Allah and His Prophet , peace and blessings be upon him,is that the making of three-dimensional representation is not allowed except where it is used as an educational tool or children’s toys. So far as other forms of drawn pictures we do not see any harm in them, particularly where they serve a useful purpose. From all of this, I hold that the pictures used to make cartoon movies are among the images that are permissible to produce – and Allah knows best. Consequently the sale, purchase, and viewing of cartoons is also permitted as long as all of these activities are engaged in according to the dictates of Islamic Law. The cartoons should have appropriate content and be used in an appropriate manner. They should be free from falsehood and immorality. Indeed, the production, distribution, and showing of Islamic animated cartoons that accord to Islamic teachings are ways by which a Muslim can seek Allah’s reward. Therefore, we do not see any harm in images, pictures, and photography if it serves a useful purpose such as education, identification, and entertainment for children. However, if there is no need for the use of images, then it may be better for Muslims to be cautious and avoid them, as was done by some of the companions. Are suicide bombings lawful in Islam?